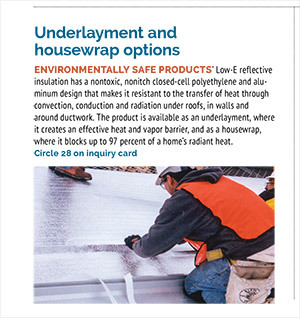 Low-E™ Therma-Sheet Insulation has always offered the benefits of Low-E™ – an industry-leading thermal and moisture barrier - to the roofing industry. Now, Therma-Sheet has earned certification by the International Code Council Evaluation Service (ICC-ES), meaning Therma-Sheet meets all requirements of a stand-alone roofing underlayment for the building industry. Because Therma-Sheet can now be used as a single underlayment product rather than part of a "sandwich" of products, it offers a more affordable means of energy efficiency to homeowners, and reduces installation time and required materials. Therma-Sheet is a 99% pure polished aluminum facing heat laminated to a closed cell foam core. It provides excellent thermal and moisture protection under metal roofing, stone coated steel, clay tile and composite shingles. With an airspace beneath metal roofing, Therma-Sheet reflects 97% of radiant heat. Without an airspace beneath composit shingles, Therma-Sheet provides an excellent thermal break that, without reflectivity, still lowers the temperature, below your roof deck 8-12 degrees. 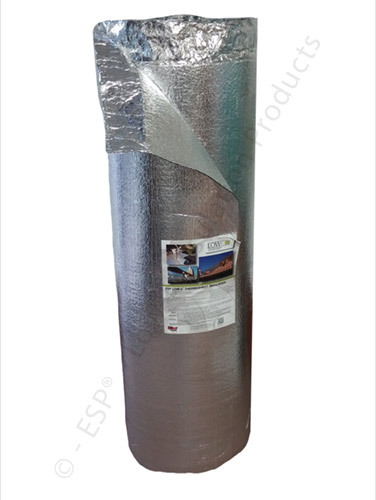 Therma-Sheet reflects up to 97% of the radiant heat that is normally transferred into the attic by super-heated roofing materials, significantly reducing attic heat gain. Conversely, Therma-Sheet prevents heat loss through the attic during colder months, all of which reduces heating and cooling costs for homeowners. It is a 99% pure polished aluminum facing heat laminated to a closed cell foam core.